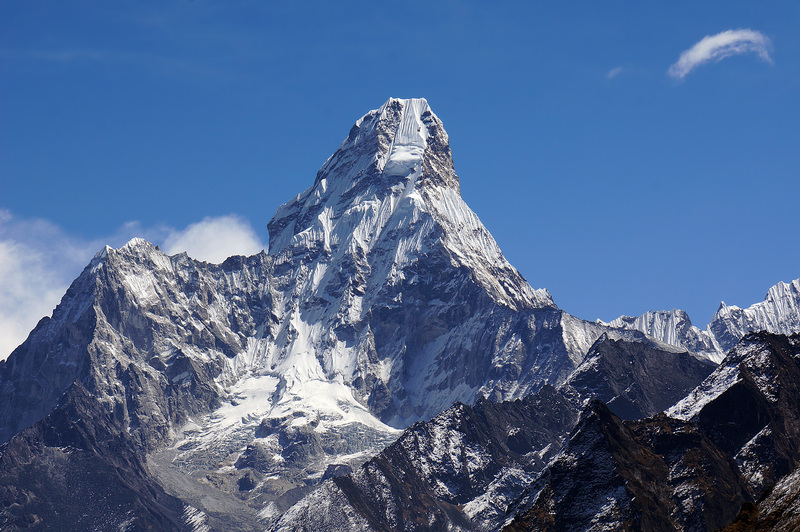 So how tall is Ama Dablam, really? At least four different heights all show up on the first page of a Google search, anywhere between 6,811 and 6,856 meters. That puts it somewhere between 22,300 and 22,500 feet tall. Regardless of its actual height (which is a fun debate! ), the best reason to climb this mountain is because of its unmistakable aesthetic appeal. 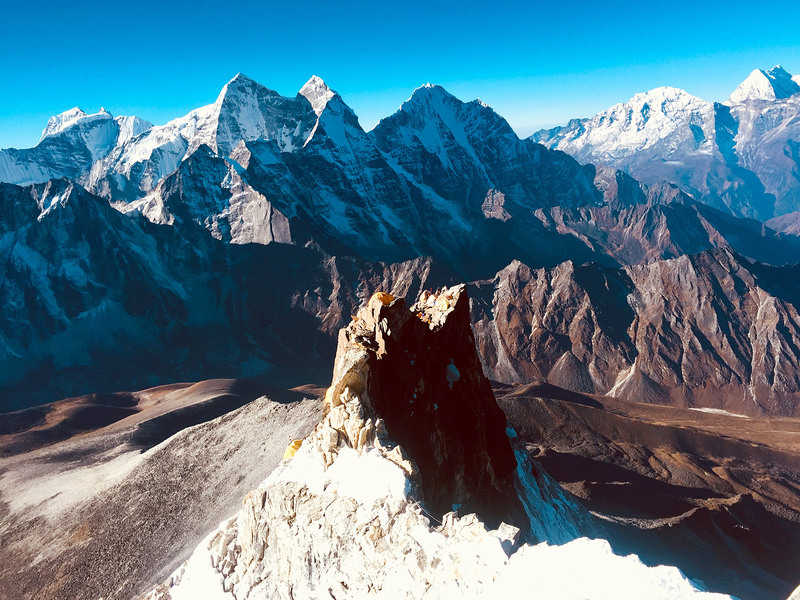 Ama Dablam looks like the Matterhorn lifted and transplanted to the Himalaya and dunked in a swarming sea of unearthly, glacier-mantled peaks. 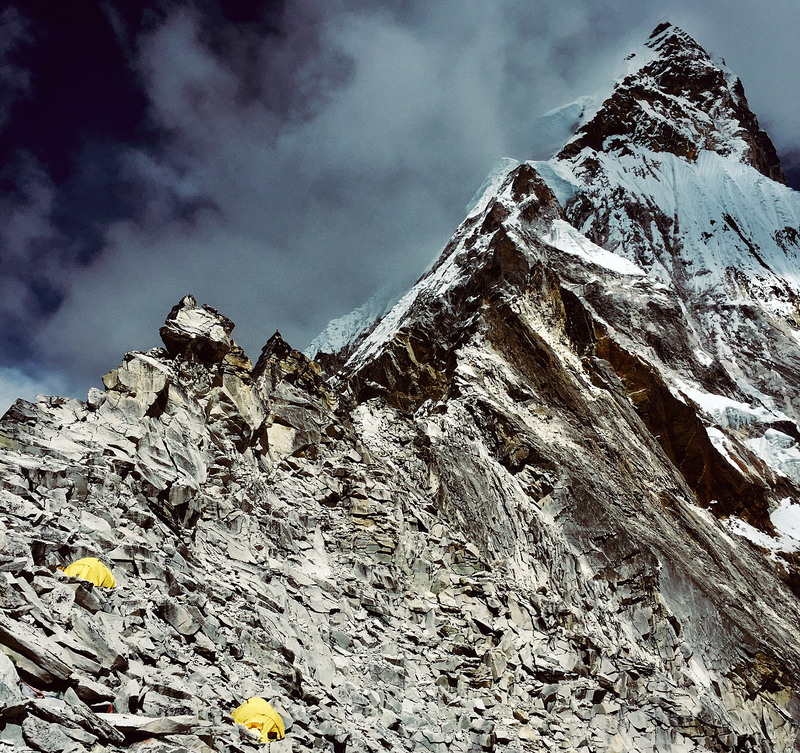 Images of the mountain evoke in the climber an immediate desire to explore this mountain  and maybe even to climb it. 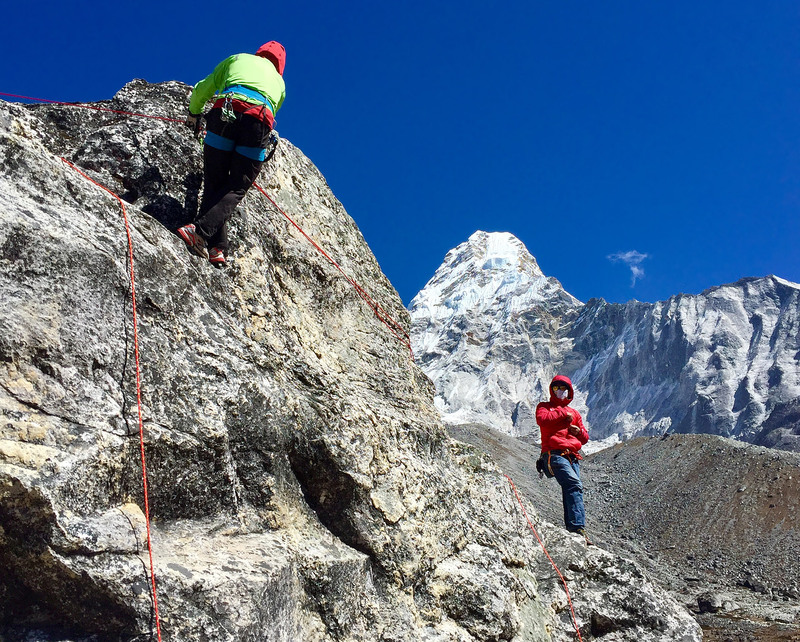 The south side features two broadly sloping shoulders supporting a mighty pillar adorned with the "Dablam" itself  a massive hanging serac that means "Necklace" in the Sherpa language. 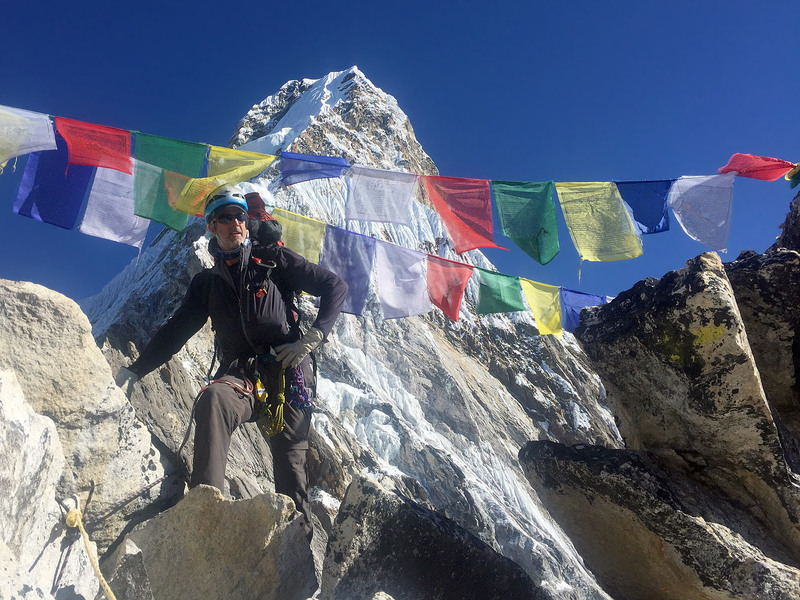 I walked into Base Camp on a cloudy day in late October, fresh from a month of climbing and guiding on Island Peak and Mera Peak. 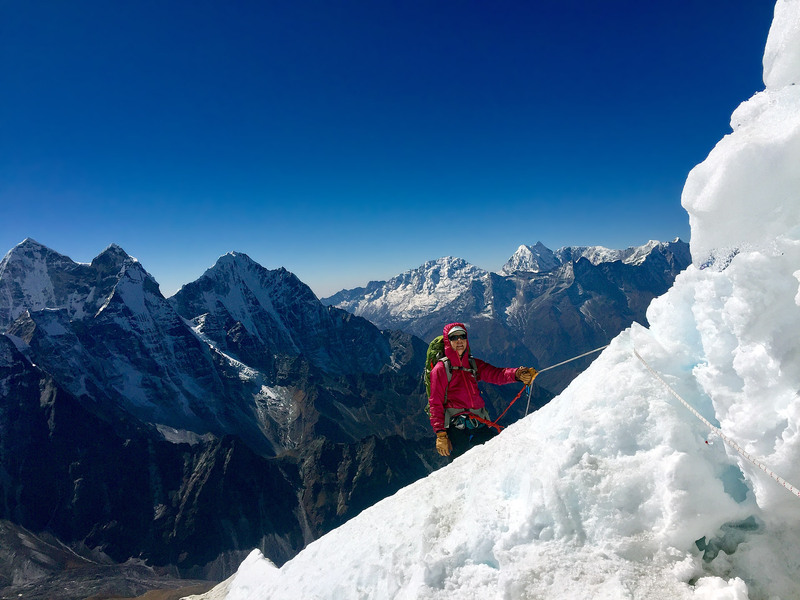 Climbing Island and Mera Peak is a great way to acclimatize for an Ama Dablam Expedition. I arrived feeling strong and ready for the technical challenges for which Ama Dablam is famous. At 15,093 feet on a flat grassy field, this is one of the cleanest, most comfortable base camps of any major Himalayan peak. Awaiting me here were 3 clients, 2 cooks, and 2 great IMG climbing Sherpa, Phunuru and Fura. Here we found  already setup  a shower tent, a dining tent, a warm cook tent, a tented toilet, and everyone had their own personal 2-person sleeping tent. Base Camp is notable for having Wifi access and a nearby lodge where, if you are so inclined, you can purchase a beer, or get warm by the heated stove. 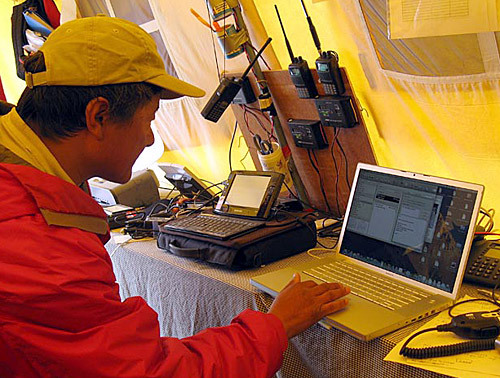 A short walk from Base Camp also gives you 2G cellphone access. IMG's Nepali and Sherpa cooks are unbeatable. These guys can cook anything. Pizza, yak burgers, French fries from fresh Khumbu potatoes, you name it. Happy from our breakfast, we headed out to a large rock located less than 10 minutes away from our Camp and began fixed line ascension and rappel training. We spent 2-3 hours here, until everyone felt confident traversing and moving along fixed lines on steep rock. The next day we decided to head to Yak Camp on an acclimatization hike. 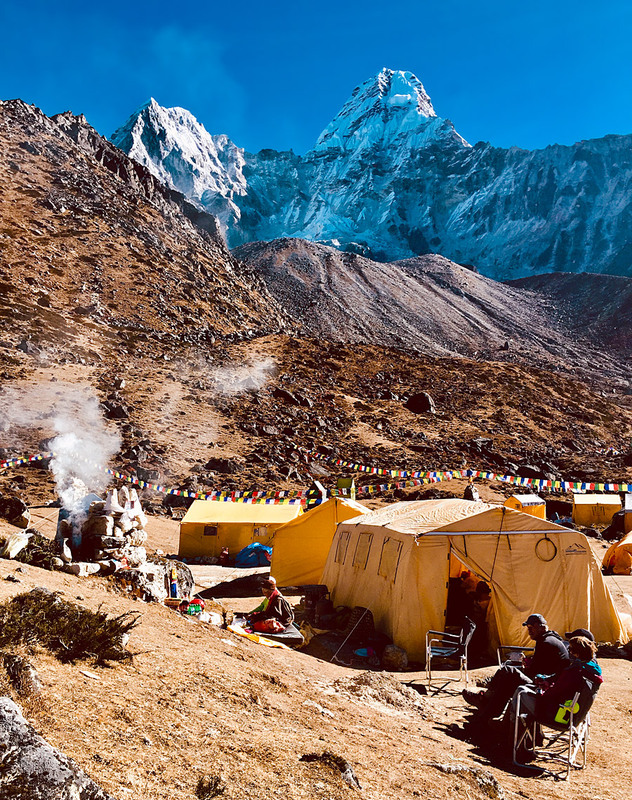 Yak Camp is a good 3.5-hour hike, as you trek from 15,100 feet up to 17,700 feet. The hike down is much quicker, maybe 1.5-2 hours. 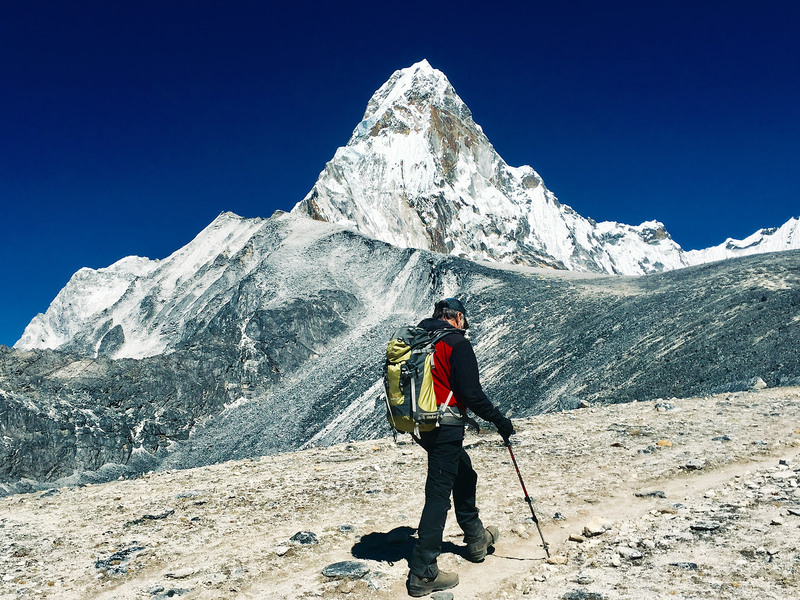 The acclimatization hike to Yak Camp consists of gentle slope angles, is often snow-free, and is a common practice among all Ama Dablam climbers. The views get better as you go up. After our hike to Yak Camp, we took a rest day prior to our first rotation up the mountain. We also had our puja, where a lama came from Pangboche Monastery to bless and protect our climb. 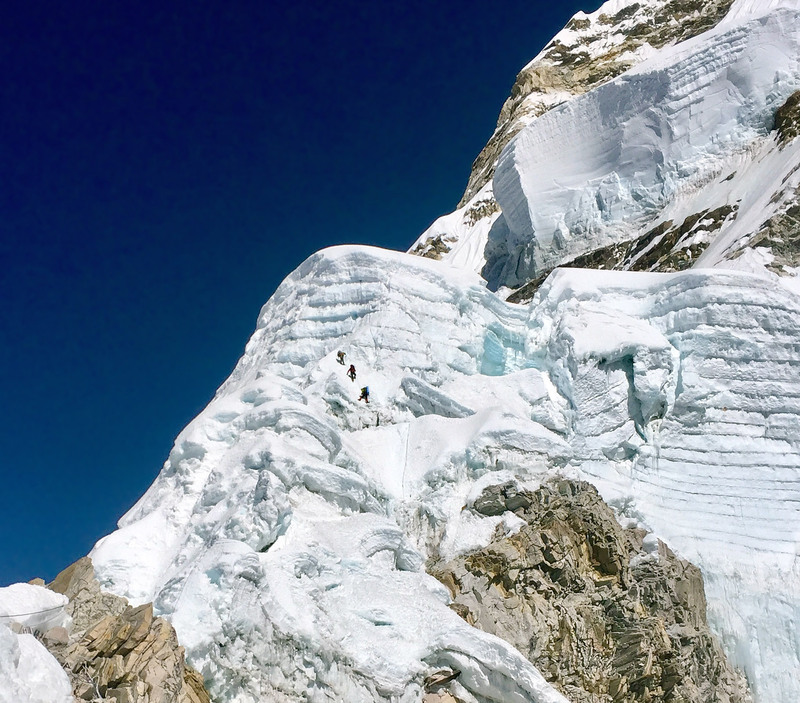 Our plan for the first rotation would be sleep one night at Yak Camp, head up to Camp 1 for a night, then climb to Camp 2 where we would tag it, and head back to Camp 1 for a second night, before heading back down to Base Camp. Our cook, Pasang, accompanied us to Yak Camp, where we had a fine dinner and breakfast before climbing to Camp 1. The nice thing about Camp 1 is that it is protected from the wind. We found it warmer than Base Camp at times! If you carefully climb out onto the ridge, you can also get 2G cellphone access. We had a great night here. 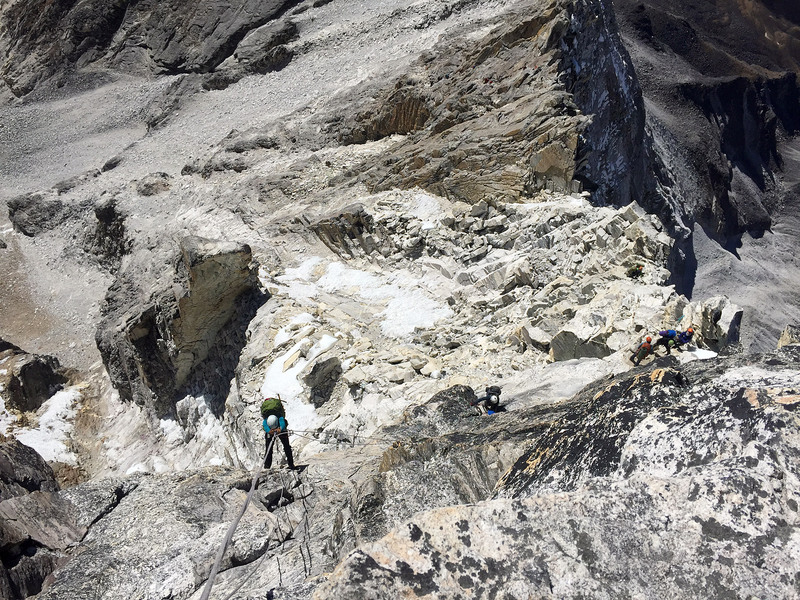 The climb along the ridge to Camp 2 is fun and the physical movement is mentally engaging. There are a few steep traverses, and of course there's the Yellow Tower, a challenging and extremely fun section of the whole climb. I found the ropes to be more than adequate, and the Yellow Tower is bolted, so I felt secure climbing and descending it. 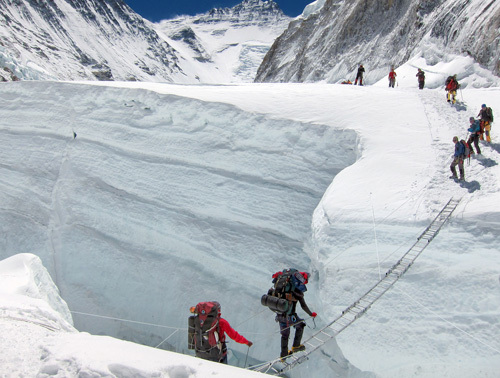 Sherpa Fura and I collected some ice for melt-water, while the team had some lunch, prior to heading back to Camp 1. 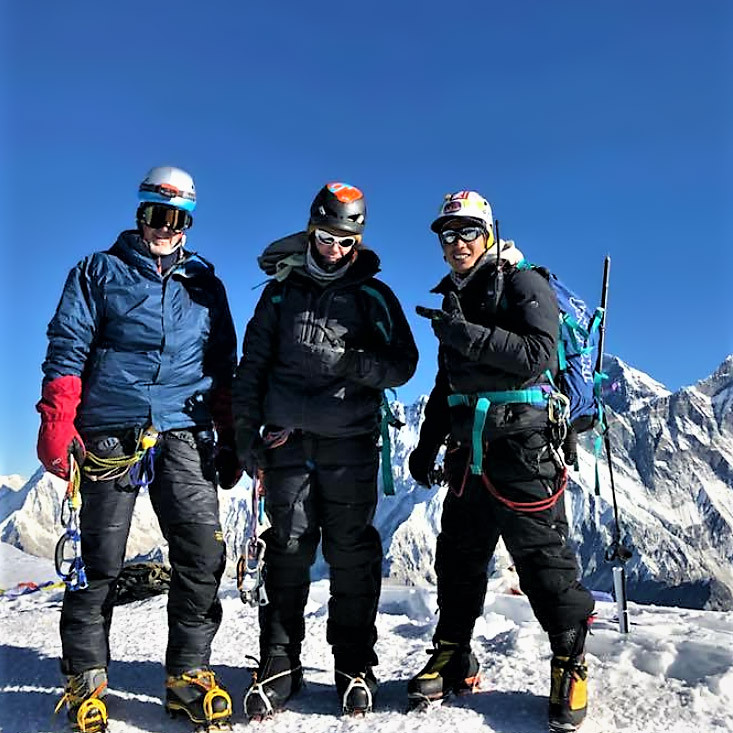 On our return hike to Base Camp, we ran into climbers from another team we knew, congratulated them on their summit climb, and otherwise had beautiful sunny weather on our hike down. We were stoked! The plan from here was to wait a few days, get strong and rested before making our summit push. But as the saying goes, you don't decide when you get to climb the mountain, the mountain gets to decide. 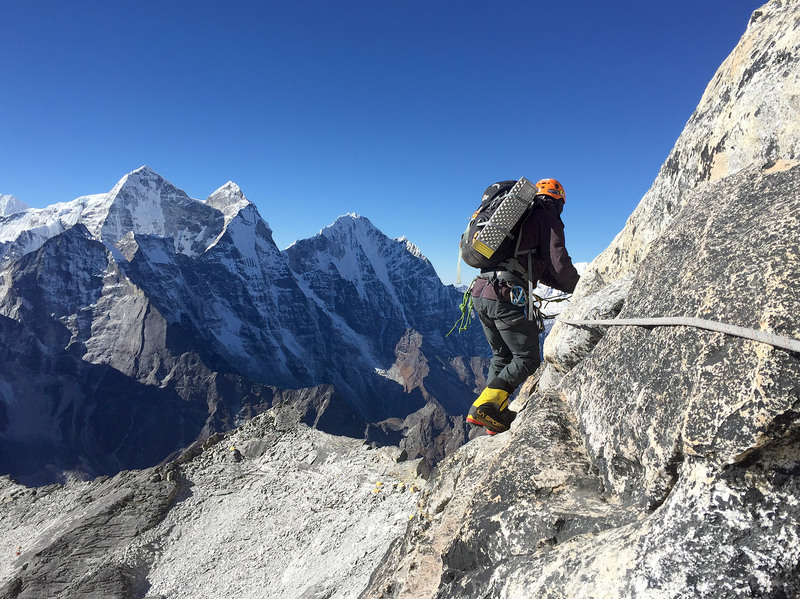 Ama Dablam decided to have summit winds to the tune of 105mph, delaying our summit push by a day or two. 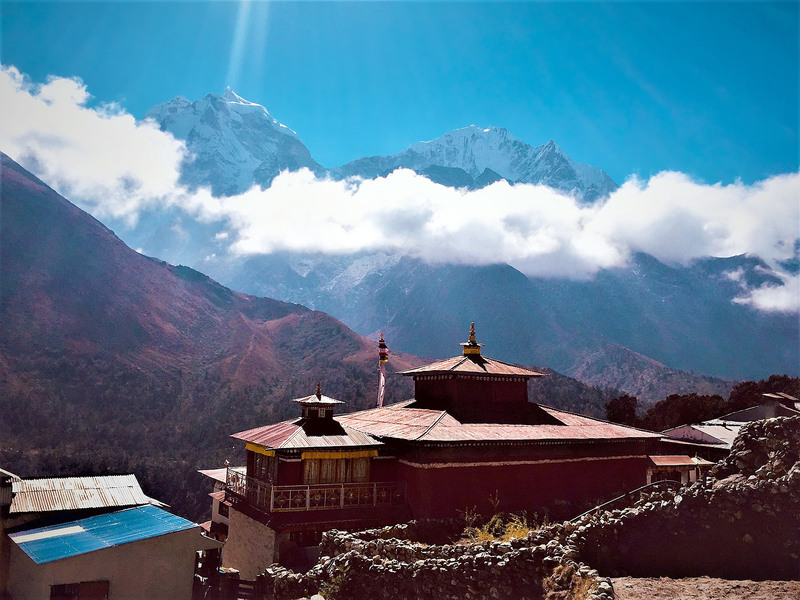 The great thing about Ama Base Camp is that it's located a short 2-3 hour walk from a major village in the Khumbu Valley, Pangboche. Base Camp is also within striking distance of Mingbo La (Pass), a mountaineering objective with stellar views into the Hongu Valley. 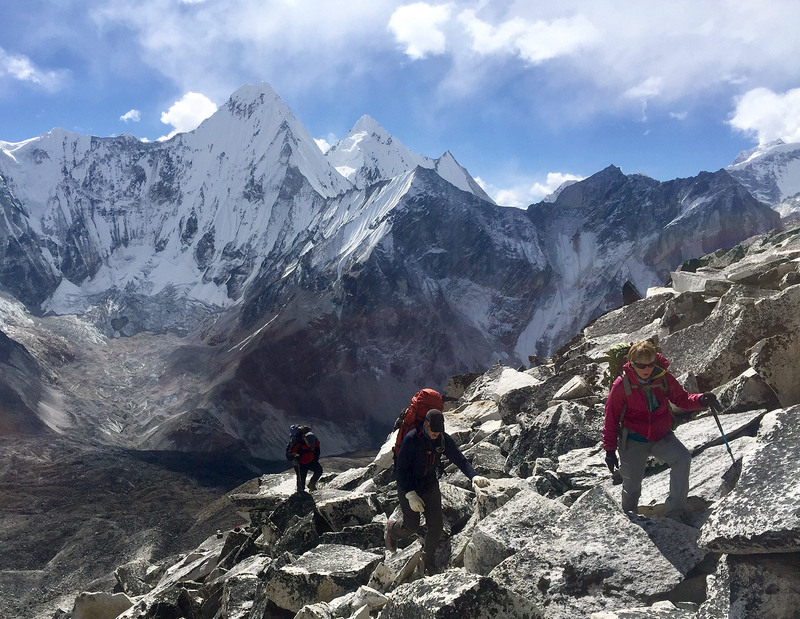 We decided to hike down to Pangboche for a night for a shower and some lower altitude at 12,400 feet before making the 3-hour hike back to Base Camp prior to our summit push. The weather had swung for the better with some stable high-pressure conditions, so we decided to go for it! Phunuru had the great idea to hire yaks to carry our climbing duffels to Yak Camp, lightening our loads. 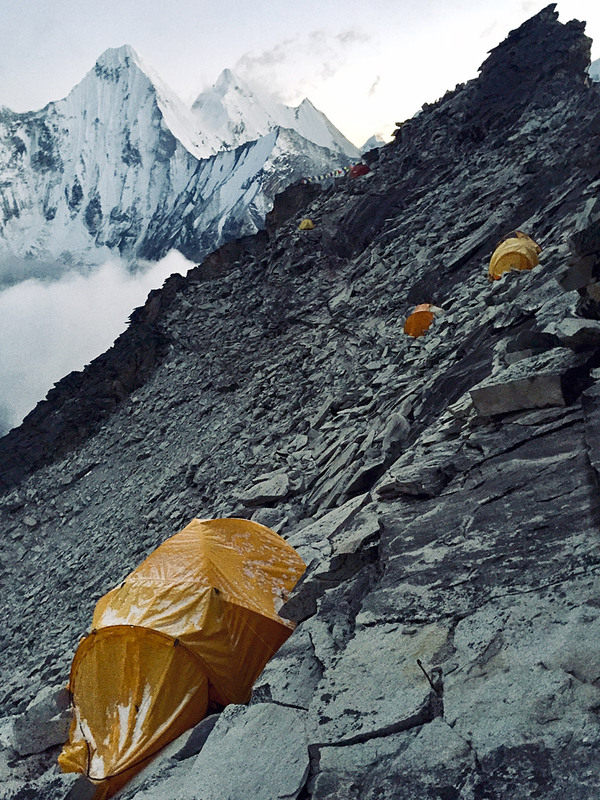 Once at Yak Camp, we stopped briefly, grabbed our climbing gear and then finished that first day by climbing up to Camp 1 where we would sleep. Base Camp to Camp 1 took between 5 and 6 hours that day as we gained 4,000 feet in elevation. Day 2 of our summit push took around 4 hours and we made it to Camp 2 by early afternoon. Camp 2 only has tent space for about ten tents, and its position on the ridge is storied in the annals of mountaineering. We enjoyed the views, and the night passed with light winds at 19,700 feet. Our climb to Camp 3 the following day took longer than normal, as this was a low-snow year and involved more climbing of rock than snow up the Gray Couloir and along Mushroom Ridge. For rock climbers, however, this makes the physical movement very enjoyable. Indeed, I found the climbing between Camps 2 and 3 the most enjoyable of the whole trip. Now we were in new terrain, above Camp 2, and the 5-6 hours of climbing went by quickly. 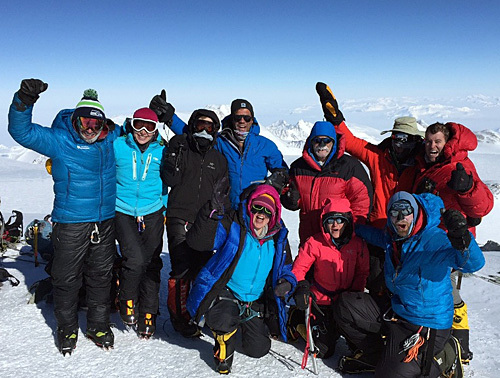 We made it to Camp 3 by mid-afternoon and found ourselves at 20,700 feet. Only 1,700 feet of climbing to go! 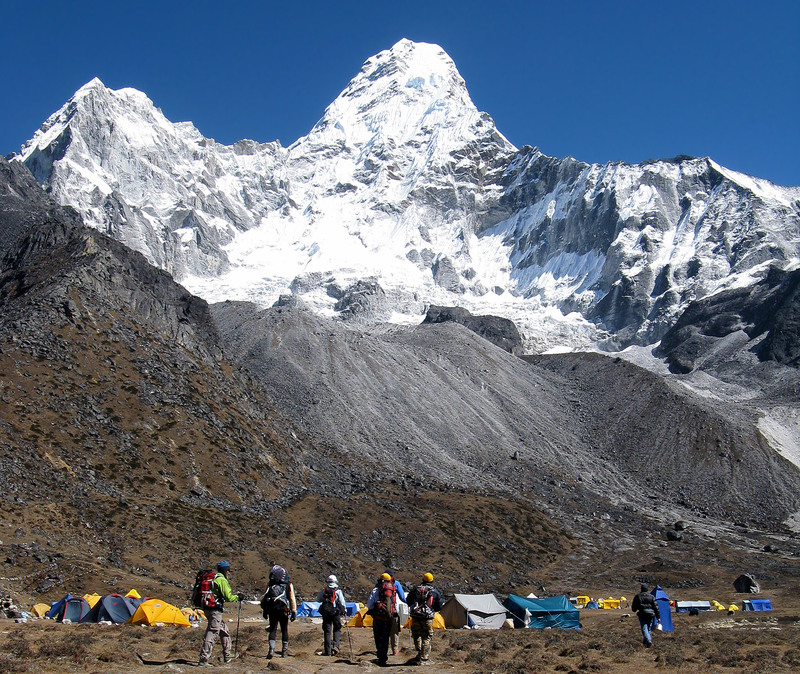 Camp 3 has magnificent views of the Dablam and sits on glacial snow flat enough to land a helicopter on. 4-5 tents occupied the ground. With three of us tucked nicely into one tent, we kept warm and cozy. We woke up at 2:45am and were climbing by 4am on our summit push. Winds were pushing 15-20mph, temps were cold but doable, and the sky was clear. I wore Neoprene overboots and puffy pants, but only a medium weight pair of gloves with a Hot Hands insert. For a few minutes I worried that I'd over-dressed, only to realize that I had nailed my clothing system perfectly. The climb to the summit is over 50° in angle and does not change that much. There is one good resting point for a bathroom and water break, but when it's that cold, breaking for too long isn't a sound strategy. We continued upward. We were on the summit in 3 hours and 45 minutes, with beautiful views of Everest and the eastern Himalayan range behind us. The summit is nice and broad and, surprisingly, quite flat. After many rappels, we made it back to Camp 3 in under 2 hours, grabbed some hot drinks and soup, then packed up for our descent to Camp 1. We made it from Camp 3 to 2 in around 4 hours, around 2pm, where we took a break to pack up more gear and have a snack. We then made it to Camp 1 before 5pm. Tired from the 12-13 hour long day, but more mentally tired than anything due to the 5 hours of abseiling. We were happy to settle into our tents, eat, drink, and go to bed. We arrived in Base Camp just after noon the following day, in time for a delicious lunch, after a 3.5-hour descent from Camp 1. The weather was sunny in Base Camp, and we were happy to relax, take naps, and pack up our gear. At dinner that night we enjoyed a Summit Cake prepared by Pasang, our great Camp cook. The team had completed our mission. Now it was time to head back to Kathmandu to exchange photos and celebrate! I'd like to thank Phunuru, Sherpa Fura, Pasang, Depraj, Val and David, for their fellowship, courage, hard work, and determination in making this year's expedition a successful one. 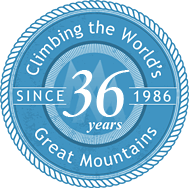 I was very impressed with your organization and had a terrific time on this trek and climb. Logistically, this trip was about as perfect as you can get. 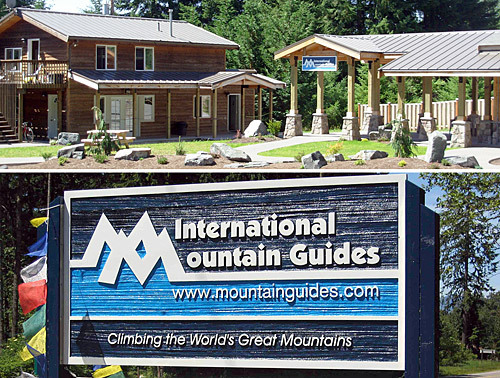 I would never hesitate to recommend IMG to anyone considering a guided climb. 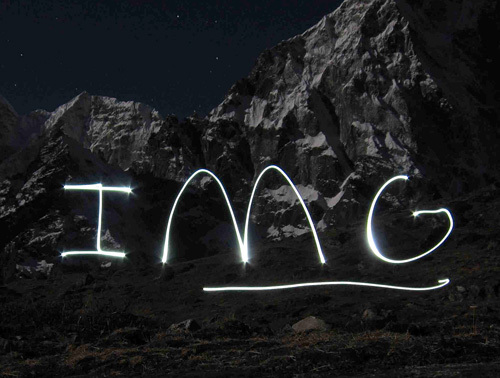 I had a fantastic experience with IMG. I found you to be head and shoulders above your peers at other firms in terms of your flexibility, knowledge and professionalism. 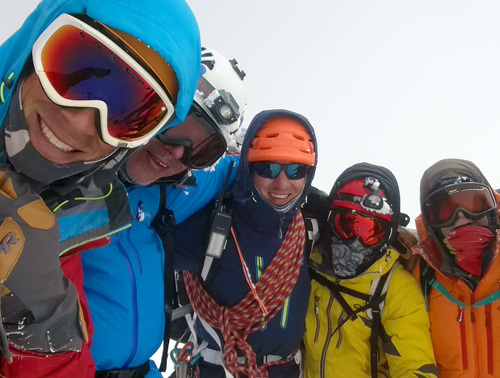 Furthermore, you employ some of the best guides on the mountains... After a lifetime of travel, this trip may have been the best travel experience I have had from a planning and logistics standpoint. I thank you and your team for making possible such a memorable and important trip for me.